Tanks & Tablecloths is a collaboration between artists Elizabeth Masterton and Lizzie Ridout. 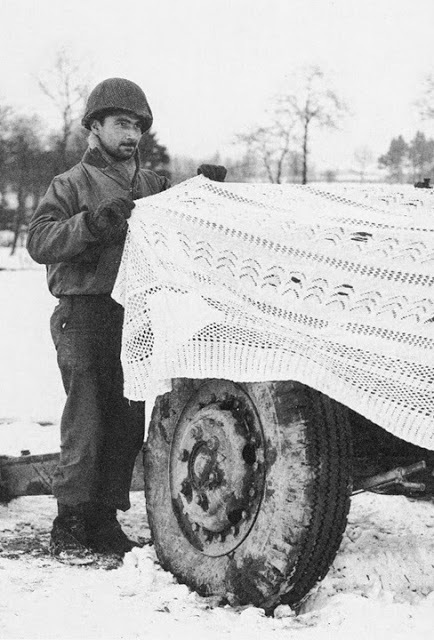 In 2004, we chanced upon an image of a soldier camouflaging artillery with a tablecloth. We were intrigued by the absurdity, yet entire practicality of using a tablecloth to camouflage a large gun. There’s a tension between the clean, lacy tablecloth and the dirty, rugged gun-and by extension, the soldier draping the cloth delicately over it. 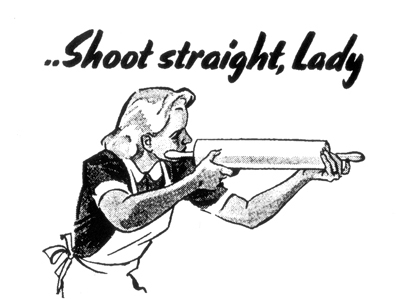 Soon after, we found 'Shoot Straight Lady' in a book of Second World War recipes. Where the soldier presented the military with a hint of the domestic, this second image demonstrated the domestic with the suggestion of military strategy, poise and efficiency. These two images raised a variety of questions in our minds which encouraged us to explore the relationship between the military and the domestic in more detail. And this was when Tanks & Tablecloths was born. We were invited to test some of our initial ideas at Newlyn Art Gallery: two significant new works, with ancilliary works made on site, and constantly shifting, during the course of the week-long exhibition. Dividing the gallery into two zones of operation, military (MILOPS) and domestic (DOMOPS), the space was dominated by a plotting table, a direct visual reference to those used by the RAF in World War II, which straddled an area demarcated as 'No Man's Land'. 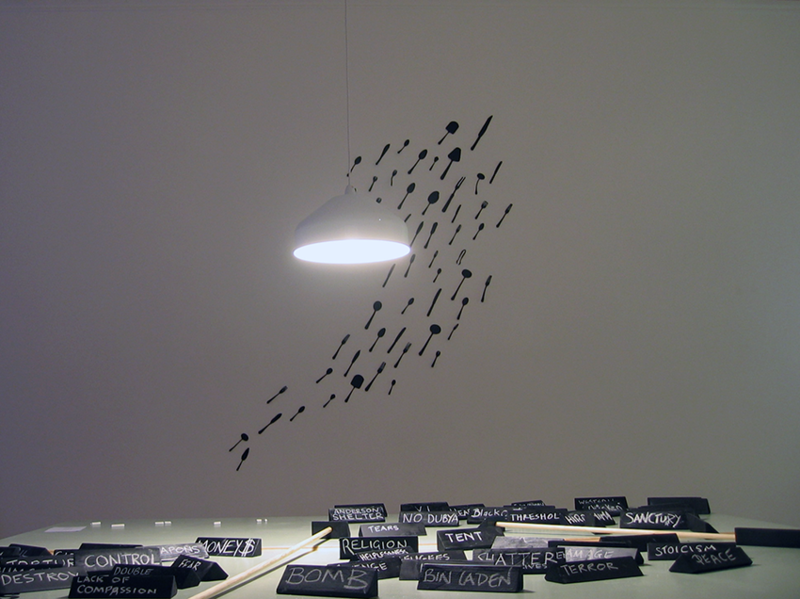 The table was designed to function as a three-dimensional mind map for visitors, who chalked their own words relating to ‘Tanks’ and ‘Tablecloths’ and physically pushed them with a plotting stick to create interrelationships with other words. 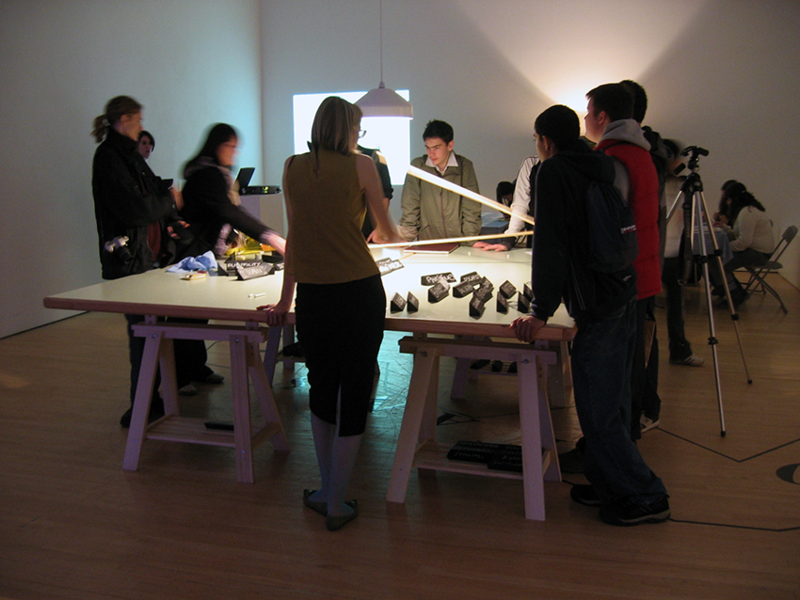 The table was used not only as a means to discuss ideas, but also as a more creative way of visualising more complex notions. The second major work was Spit & Polish. The idiom resonates in both spheres. In these early stages of the project, archetypes of the Sergeant Major and the Housewife were deployed to signify the military and domestic. The obsessive tidying of the Housewife echoed the pedantic fervour of the Sergeant Major. The Sergeant Major deployed chores to occupy the ranks, whilst the Housewife battled accumulations of dust and dirt threatening to overrun the home. This theme of time reoccured across the show: ivy became a resonant visual motif for time's simultaneous destruction and growth. 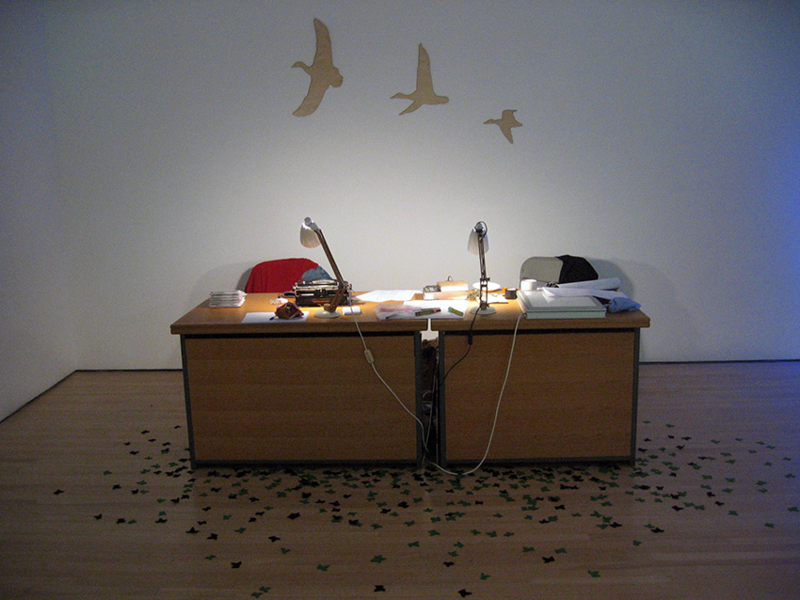 In our MILOPS space, felt ivy leaves slowly spread across our desks throughout the course of the week, creating an artwork – Hedera Xileh – that emerges over time. The act of polishing is significant also in this respect. The soldier’s black leather boots are polished both to maintain integrity, and to present an acceptable appearance. 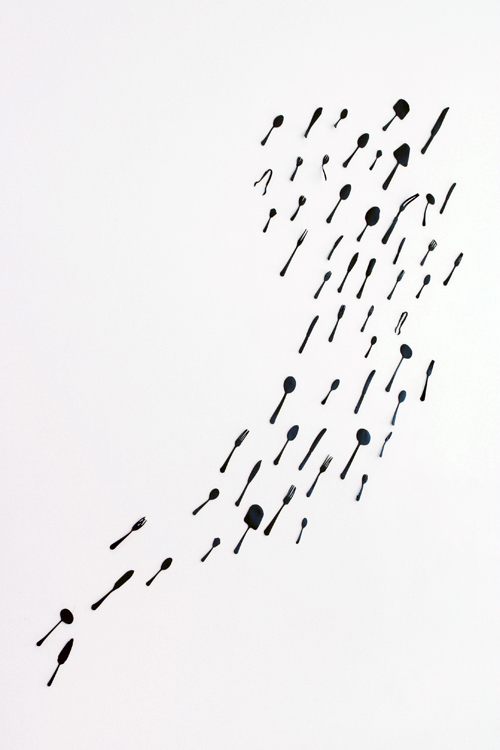 The Housewife’s silver cutlery must be polished to prevent both the black tarnish of time, and the whispers of the neighbours. 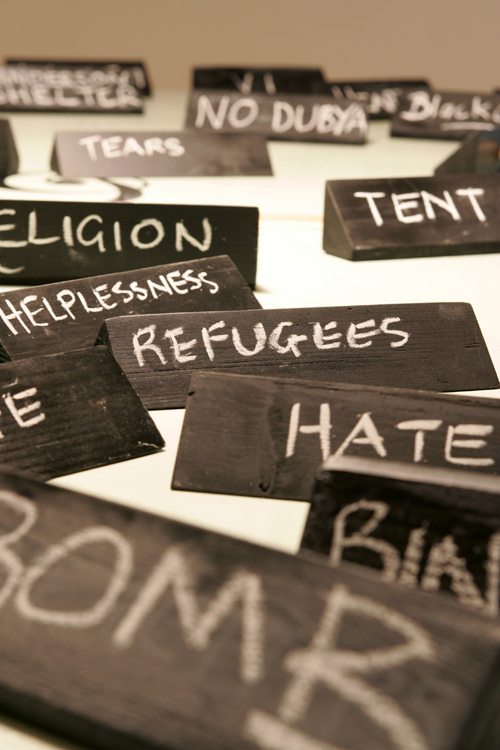 Black is rigorously applied to one, and removed from the other. 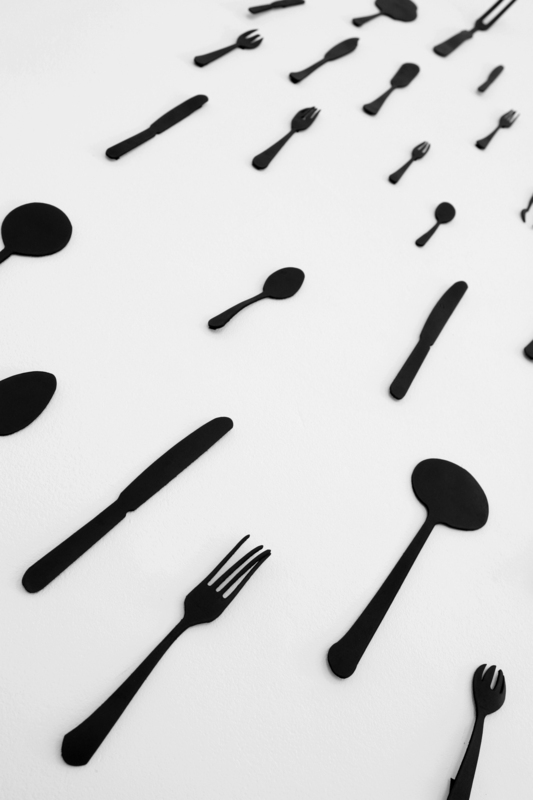 For the exhibition, we produced a set of laser cut cutlery in black leather which was affixed to the gallery wall, in close proximity to the plotting table, in a 'swarm' reminiscent of a radar signature of airborne objects. Over the course of the Newlyn show, we gathered archival material that visually represented both the military and the domestic. This archive became known as TATRA, or the Tanks & Tablecloths Research Archive. 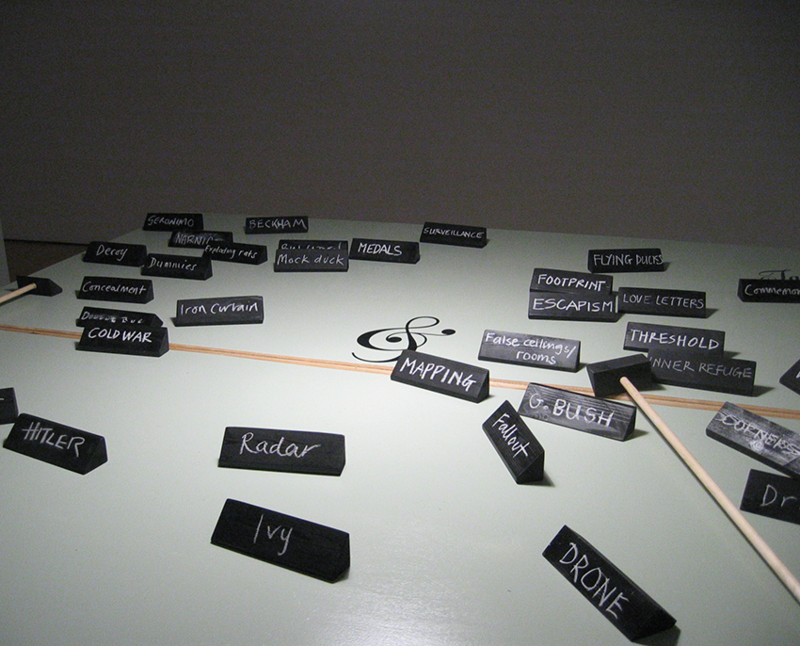 We asked the visiting public to donate or suggest images of items throughout the course of the exhibition. These images, along with subsequent gatherings, can be found here at the Tanks & Tablecloths Index.